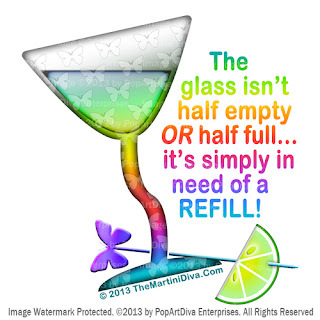 ....IT'S SIMPLY IN NEED OF A REFILL! "Is the glass half empty or half full?" is a classic philosophical question about life and how you see it. Being an optimistic cynic with a penchant for cocktails (yes, that is how I view myself), this is how I answer that question! I suppose this comes from being a mature optimist with a slightly twisted sense of humor and a cocktail or two under my belt. After an undisclosed number of decades on this planet, I have come to the conclusion that my glass as neither half-empty or half-full but just in need of a topping off! In the Cocktail Zen of my mind I brought this Yin and Yang of happy hour hiccups to the zeitgeist of today's cocktail culture and created a rainbow colored martini glass etched with butterflies and garnished with a touch of lime tartness on a butterfly cocktail pick. To me the rainbow and the butterfly are both great visualizations of the "half-full" philosophy balanced by the acidic addition of a splash of "half-empty". I guess what I'm saying is too much sweetness and no tart makes for a very cloying cocktail - and a very boring life! 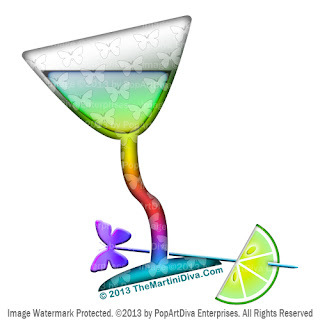 GLASS HALF FULL / BUTTERFLY MARTINI is available with and without the text and on a variety of Art, Gifts & Products on The Martini Diva Boutique. Other Famous Reactions to "The Glass Half Full/Empty""
Bill Cosby - "Is the glass half full, or half empty? It depends on whether you're pouring, or drinking." George Carlin - "Some people see the glass half full. Others see it half empty.I see a glass that's twice as big as it needs to be."